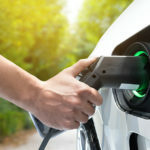 Posted December 11, 2018 by Charged EVs & filed under Newswire, Sponsored Content, The Tech. It runs with no emissions, it’s completely autonomous and, what’s more, it’s networked with the entire world – this is what the car of the future will look like. Thanks to rapid advances in the field of electronics, the vision of a (fully) autonomous vehicle, which appeared unrealistic just a few years ago, is now within reach. “The more influence electronics have on our daily life, the more important dispensing technology becomes,” explains Christian Ostermeier, CEO of Scheugenpflug AG. Failures and defects in electronics can cause serious material and financial damage. In the worst case, they can even cost lives – for example, when the Electronic Stability Program (ESP) or airbag sensors are defective. “The electronics must therefore have long-term protection against exposure to harmful agents such as moisture, dust, extreme temperatures or aggressive media,” continues Ostermeier. We can pull off this feat with precise, and repeatable, adhesive, sealing and potting processes, and the selection of suitable casting resins. Over the years, there has been a steady increase in the amount of electronics installed in cars. Systems such as anti-lock brakes (ABS), light and rain sensor systems and airbags have become standard. Driver assistance systems such as fatigue detection or emergency brake assist, which were previously reserved primarily for premium vehicles, are now increasingly gaining ground in all model segments. With the continued development of the electronics, the demands on dispensing technology are changing as well. “The potting tasks are becoming more demanding, and at the same time, more and more casting resins with complex formulations or high filler content are being used,” says Christian Geier from Scheugenpflug Inc. in Kennesaw, Georgia (USA); this is in response to increased customer expectations. “The processing of these media can be very challenging, so the need for consultation has increased significantly,” continues the CEO of the Scheugenpflug subsidiary. The medium-sized enterprise from Neustadt an der Donau in Lower Bavaria, which has two subsidiaries in China and one in Mexico, in addition to the one in the US, has a great deal of expertise in this field. Not only was the sheer number of available casting resins growing, but the quantities of materials demanded were also increasing. “In addition to potting tasks where large volumes of media have to be applied, small and very small quantities are also seeing an increase in demand. The challenge here is to reliably cover the entire spectrum of required volumes,” says Christian Ostermeier – and, of course, to do this while complying with the cycle time requirements. Autonomous driving is just one example of the high levels of expectation. Current test vehicles each have six to eight cameras plus radar and lidar units on board; these produce around 50 terabytes of data every hour. But that is not enough for fully networked, autonomous vehicles, for which the data volume will increase to around 150 terabytes. “When potting the associated sensors, cameras and control units, it is important to ensure that the application of material is precise and repeatable, regardless of whether the amount to be dispensed is 0.08 milliliters or 50 milliliters,” explains Christian Geier. Another, almost opposite extreme can be observed when potting high-voltage (HV) batteries for e-vehicles. In these cases, large quantities of thermally conductive paste are used to prevent damage to the battery and vehicle as a result of excessive temperatures. For each vehicle, approximately five to ten liters of these media are dispensed between the battery modules and the housing which encloses them, and this trend is increasing. “Due to their high viscosity and the high proportion of abrasive fillers, the application of heat transfer media is a challenge in light of the required cycle times as well,” says Geier. When selecting the appropriate system technology, it was therefore essential to pay attention to customized feeding and dispensing systems. Otherwise, users would risk higher maintenance and repair costs. “The best technology, however, is of little use if it is not used optimally. This is why it pays to seek a close alliance with the system and materials manufacturer at a very early stage of the project,” says Geier. This gives us the opportunity to provide users with existing empirical values and thus to get the most out of the potting task in terms of quality, cycle time and process reliability. Electromobility picks up speed: Vehicles with alternative drive systems are regarded as a key element in the struggle against noise pollution and constantly increasing emissions. The core component of these vehicles is their integrated high-voltage (HV) battery. Thermal influences have enormous effects on their service life, capacity and particularly on their operational safety. Outside temperatures of 50 to 77°F and operating temperatures of approximately 68 to 104°F are ideal for the normal operation of an e-vehicle. Excessively high temperatures can cause internal short-circuiting resulting in severe to irreparable damage to the HV battery and vehicle. In order to prevent this damage, large amounts of thermally conductive paste are dispensed between the battery and the housing. These media ensure reliable heat transfer and thus contribute to preventing potential defects due to overheating. Scheugenpflug has a new dispensing solution in the program especially for this task. The extremely robust system, consisting of the high-performance Dos HP dispenser and the PailFeed200 abrasive material feeding system enables dispensing speeds of up to 80 ml/s even for highly abrasive thermal interface materials. The new dispensing solution is able to apply one liter of thermally conductive paste in just 13 seconds.